I’ve hesitated to post this particular subject because fear is a scary thing. I’m talking about those thoughts deep down in the crevices of your brain that you know will come back to haunt you. For me, that’s like giving in to weakness, if you will. I fear the future me. Did I succeed in life, or was my life full of failure? Am I happy? Did I write a book? Am I alone? Whatever the case, I fear that I won’t be successful. Whether it’s writing (and finishing) a novel, meeting new people or accomplishing something that changes lives, I fear that I will never amount to anything let alone have something to show for my hard work. There are so many standards and procedures that you should follow the path of success. I know that I strive toward each of those things and work my hardest to achieve the best that I could possibly have. But what if it’s not enough? I’ve been told that it only matters what I think and that I should gauge my life on how I think it should be lived. If I were to live by that standard alone, I’ve already failed. I am unsuccessful and that, my dear readers, scares me. My reason for being unsuccessful? It’s simple. I have not completed a novel. I’m not even close to finishing. I haven’t put myself in a situation to meet a new person in a long time, and I don’t believe that I’ve done anything to change anyone’s life. By my own standards, I have failed. My fear has become real at this point, and I have achieved it with little effort. So in this case, where do I go from here? Sure, I could try to change it. I know that the things I want and desire are possible. But sometimes, the fear of failure holds me back. Such a vicious cycle. Then there’s the fear of success itself. As weird as it sounds, I fear genuinely succeeding. What happens if I do write that novel and it gets published? When I meet new people, then what? What if I do touch lives? My mind considers the previously listed items as plausible events, but then the question rises to the occasion. If I succeed in the small victories that I want to accomplish, what comes next? Not to mention, once you do manage success, the standards have been set. I’ll be required to submit similar or better-valued items the next time. So of course, we’re left with nothing more than”What’s next.” I still have no answer for this. That probably sounds stupid, because, in reality, I’m sure it is. I shouldn’t be afraid to succeed, yet once more, my sanity should be questioned because I, after all, fear success. How fun, right? I fear my depression. I fear the possibility of being consumed by its claws. I fear my incompetence. I fear my thoughts and feelings, emotions and mind. I scare myself because I am capable of a multitude of things. I fear the things that I have accomplished and done as well as what I may achieve moving forward. I fear unhappiness. The thought of living life with little to no happiness frightens me. How can a person live if she is unhappy? I’m not always miserable, but there are moments where it’s overbearing. What if there is no light at the end of the tunnel? I fear the loss of my senses. Have you ever had your ears cut off on you? Where they randomly put you in a bubble and everything is unclear? What if I lost the ability to enjoy the artistic songs that I hold so dear. Music is vital to me and my sanity. It helps lift me up and have a better day. There are times where I fear that I will lose this happiness and it scares me beyond words. I fear the loss of my sight. I’m scared that one day, I won’t be able to enjoy the gorgeous scenery around me, read a book or watch another movie. “Do you have a health condition,” you ask. No. I don’t, and I definitely do not plan on obtaining one. But that nasty “What if” game really plays tricks on me. I enjoy my senses. If I lost them, I feel like I would miss a part of myself. I fear judgment, of any kind. I may not be perfect, but having someone evaluate my flaws scares me. I fear that I will fail to meet someone’s expectations – like, maybe I’m not that great. I fear things because they are unknown. If I know what’s going to happen, I know how to prepare for them. If I don’t, it’s like walking into a deep, dark cave with nothing but a dollar store glow stick. Not a very comforting thought. But I’m not alone. 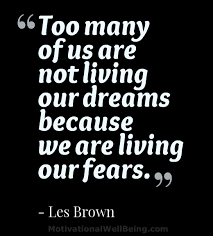 What are your fears? What stops you from success? What is your opinion on the matter? When it comes down to it, the terror is all in my head. Why do I fear these things? Because I’ve convinced myself that there is something to lose. Whether that’s the case or not, will I rise to the challenge and overcome my fear? I’ve already told myself a story that I can’t. But is there a way that I can? Am I able to overcome fear? I think in posting this here, for all to read, I’ve already conquered one. I like to think that’s a step in the right direction. Fear is such a huge and frightening topic and I am impressed by your post. I think you are very courageous to write it. And again you are echoing my thoughts. I fear a lot. It would take too long to list it all. Mainly I think I fear… people. What people might think about me. Or rather that they think bad about me/don’t like me. Because then they won’t refrain from hurting me. Yeah let’s leave it with that.